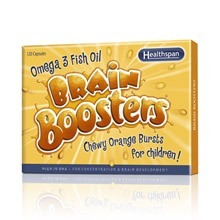 Description:- Many children don’t like the taste of oily fish; this is why we believe our delicious orange flavoured Brain Boosters* are the ideal way to ensure your child gets a daily intake of omega 3. Brain Boosters are also ideal for adults who have difficulty swallowing normal capsules. Ideally, our intake of omega 3 should come from a balanced diet which includes plenty of oily fish, yet only one third of the population eat it on a regular basis, with many eating none at all which is why omega 3 supplements offer the ideal solution. Packed full of the Omega 3 essential fatty acids DHA & EPA each delicious Brain Booster has been are distilled to remove saturated fats, cholesterol and pollutants, so you can be assured that they are the purest available. Essential fatty acids are called essential because you cannot make enough to supply your needs and they must therefore come from your diet. Two chewable capsules contain 362mg total omega 3 including 180mg DHA and 120mg EPA. They are also “100% non-fishy” and completely free from sugar, aspartame and artificial colours. Review:- I got these as I think my oldest needed a little bit of an extra boost on the vitamin, omega 3 front. He’s at nursery and anyone who has children that age will know that it seems like they have the cold every second day. He does eat well, he loves fish and prawn. He loves fruit but the only vegetables I can get him to eat is sweetcorn. It’s not the worst diet but not as balanced as I’d like. Therefore, when I was offered a chance to try the Healthspan Omega 3 Brain Boosters I thought this would be a good way to boost their immune system. Not forgetting helping with concentration. He will be starting school in August so what better way to help. Only problem, he wouldn’t take them. He put them in his mouth, bit in and spat back out. I tried it a few times but each time he would spit them out. I tried them, they were ok but not great. My nieces however both liked them so I’ve passed the rest of the packet onto them. I was very impressed with the way they are packaged. They fit through your letterbox, the packaging with the address on it is actually a coupon for money off another Healthspan product, teddy bear multivitamins which I will be buying. Even though my boy didn’t like these, I still think they are a great idea and recommend them. Disclaimer:- I was sent these capsules to try in exchange for an honest review.